This is a delightful disc, packed with immediately appealing music by a sadly neglected and underrated composer. A first rate cellist, Boccherini’s lengthy employment by the Infante Luis Antonio of Spain placed him a little outside the European mainstream. Later patronage by King Frederick William II of Prussia and French consul Lucien Bonaparte brought him more widespread recognition. 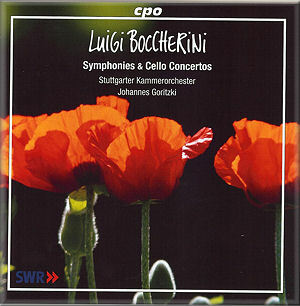 The main highlights of this disc are the two concertos for cello, both written in 1770. The first of these, in C major, is strongly reminiscent of Haydn’s own C major concerto. The lively opening Allegro sees the cello introduced in an expansive solo, with the orchestra shadowing behind in a sustained piano. The middle Andantino is mostly taken up with a sublime solo theme, while the final movement is characterised by catchy rhythms in ¾ time. The concerto in D major is no less attractive, although less accomplished than the C major work. The string orchestra here has more of a supporting role, and the cello writing veers much more towards the higher register of the instrument. The final Allegro seems to hint at Mozart, with its rustic dance patterns and tonal shifts. Equally fascinating is Boccherini’s Octet in G major for two violins, viola, two cellos, horn, bassoon and oboe. It is a sunny, virtuosic work, far beyond the run-of-the-mill divertimenti of the period. The opening Andantino develops a charming melody through alternating dialogues and ensemble passages between the instruments. The central Adagio brings the bassoon to the fore, while the concluding Allegro is much more of a shared conversation piece with a distinct Spanish accent. Less exciting is the D major Symphony, which starts the disc. Composed around 1790 for Boccherini’s Prussian patron, the work is brief at just over five minutes long and was possibly the overture to an unidentified stage work. It serves its purpose here as a curtain-raiser, but might have easily been left out of the recording. The forces of the Stuttgart Chamber Orchestra play with great gusto, directed with precision and warmth by Johannes Goritzki, who also doubles as soloist in the cello concertos. Unsurprisingly, the sound quality of the recording - made at Southwest German Radio studios - is excellent. Close, crisp and clear, it enables the ear to pick up every detail of this beautiful music.